Source: CICH graphic created using data adapted from Indigenous and Northern Affairs Canada.First Nations Child and Family Services. Program Expenditures and Statistics. https://www.aadnc-aandc.gc.ca/eng/1100100035204/1100100035205 -accessed August 21, 2017. Over 75% of First Nations children in care on reserve are in foster care. Between 2006 and 2016 the number of First Nations children on reserve in foster care dropped almost 15%. During this same time period, the number of First Nations children in kinship care doubled from 8.52% in 2008/2009 to 15.95% in 2015/2016. 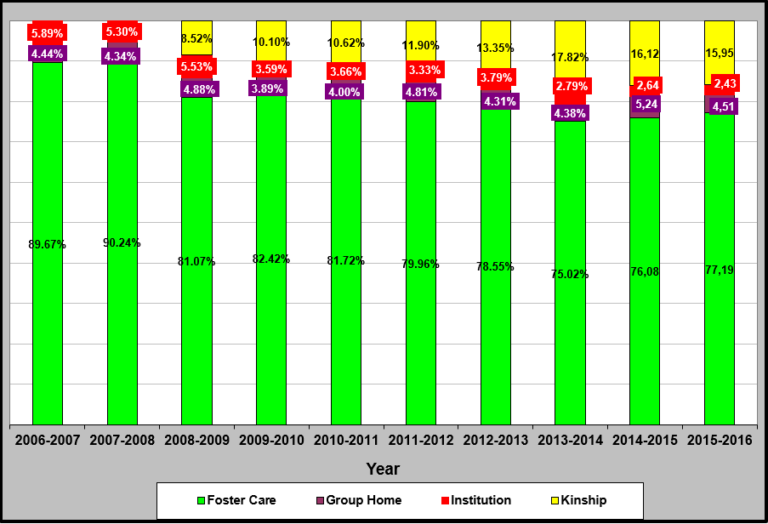 Although only a small proportion of First Nations children on reserve are in institutional care, this percentage decreased from 5.89% in 2006/2007 to 2.43% in 20015/2016. During the 1960s, Indigenous children were removed from their families and communities in masses and adopted out to non-Indigenous families in a period which has become known as the ‘60’s Scoop’. This has had devastating impacts to the health and well-being of Indigenous families and communities.1 Since then, mainstream adoptions have become controversial and greater emphasis is being placed on kinship care and traditional forms of adoption to ensure that Indigenous children grow up in a familiar environment, connected to their culture, language and members of their family and clan. These approaches are more consistent with traditional Indigenous approaches to caregiving, which was seen as a communal responsibility. There is strong evidence that when Indigenous peoples have sovereignty over their children and adequate resources, outcomes for children are better. 1Blackstock, C. (2010). Supporting First Nations adoption. Submission to: Standing Committee on Human Resources, Skills and Social Development and the Status of Persons with Disabilities. Ottawa, ON: First Nations Child and Family Caring Society of Canada.